The Azcue BT-IL Spacer Coupled Triple Screw Pump is a larger, higher flow alternative to the BT-HM, for applications where larger volumes of fuel oils and lubricants need to be transferred. As a positive displacement pump, screw pumps are able to handle lubricating fluids under fluctuating flow rates, pressures and viscosities without losing efficiency making the Azcue BT-IL suitable for a range of performance requirements. This self priming triple screw pump is horizontal in design with inline suction and discharge, supplied flanged as standard. 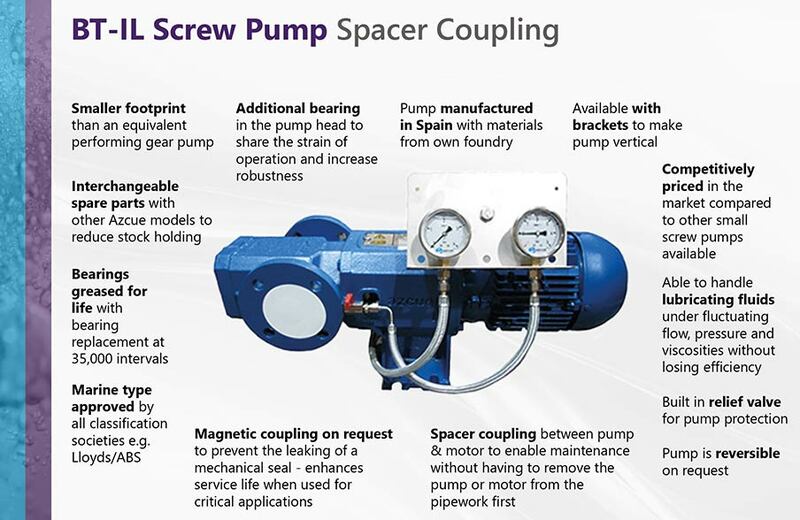 These Aczue pumps can be supplied upon request with a magnetic coupling, which eliminates the issue of a mechanical seal leaking and therefore enhances service life when used in vital applications.